When is the last time you looked at your phone while behind the wheel? Every day more than eight people are killed and more than 1,000 others injured in distracted driving crashes. It’s not just texting–drivers are posting on social media, watching videos, and playing the newest sensation, Pokémon GO. This evolving epidemic is not exclusive to teens; parents are to blame as well. A CNN special multiplatform report ‘DWD: Driving While Distracted’ highlights the latest statistics and research on this toxic trend. CNN correspondent Kelly Wallace hosts this engaging multiplatform series that takes an investigative approach on the public’s life-threatening relationship with technology, profiling the narratives of victims and advocates. Wallace explains the science behind distracted driving and explores some of the high-tech solutions being developed to address the problem. DWD: Driving While Distracted airs Saturday, August 6 at 2:30pm ET, with digital video, written analysis and visual explainers rolling out the week prior on CNN.com/distracteddriving. 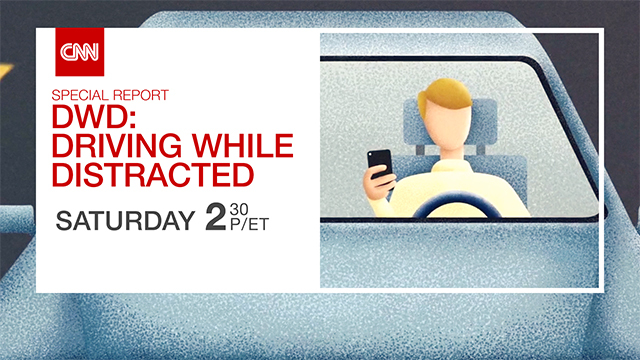 Join the conversation using #distracteddriving. DWD: Driving While Distracted was produced by Meridith Edwards.